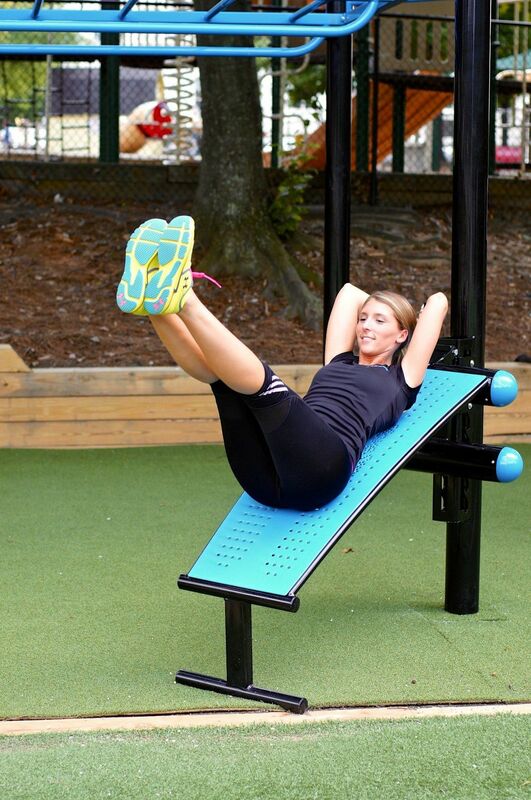 MoveStrong T-Rex Outdoor Functional Training Station. Come Out And GET FIT! 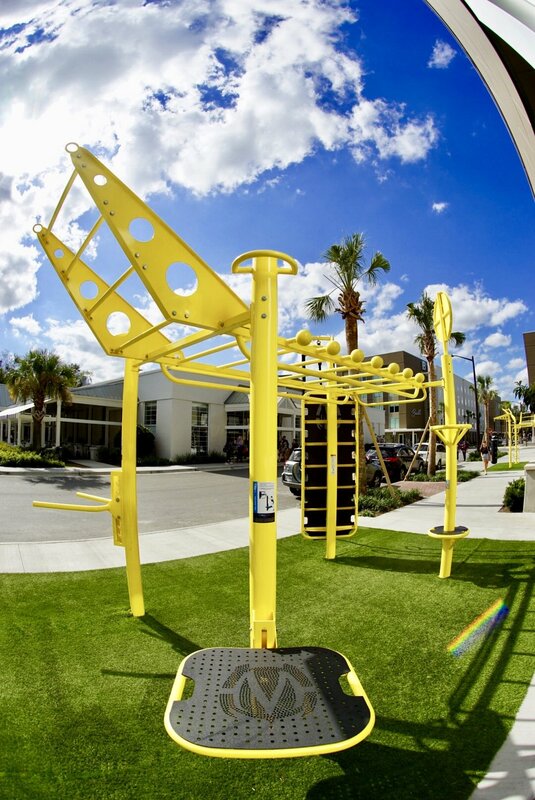 Our customizeable T-Rex Outdoor Functional Training Station (FTS) is built for year around use in a commercial setting. We blend the best of old-school calisthenics with the latest in Functional Fitness Training in an all-in-one station. Built to size and specific training features to accommodate any space and user abilities. The T-Rex is great for individual and group fitness bootcamp style workouts. 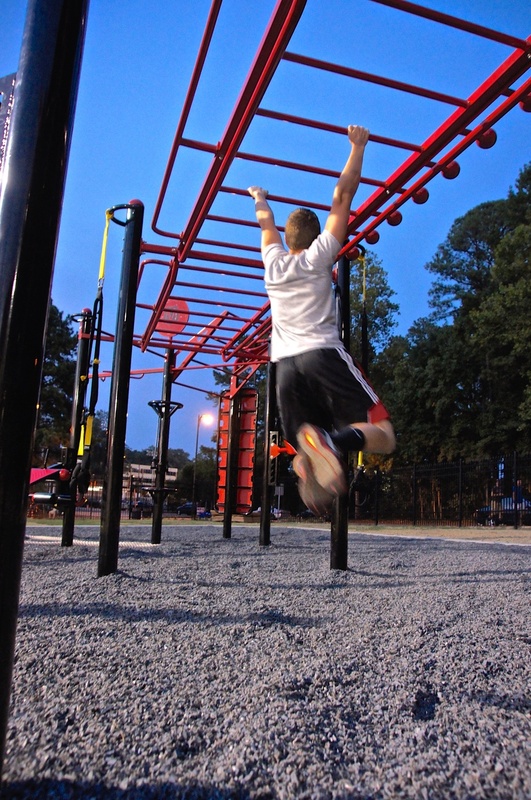 Our products are built for functional fitness and calisthenics workouts not playground use. 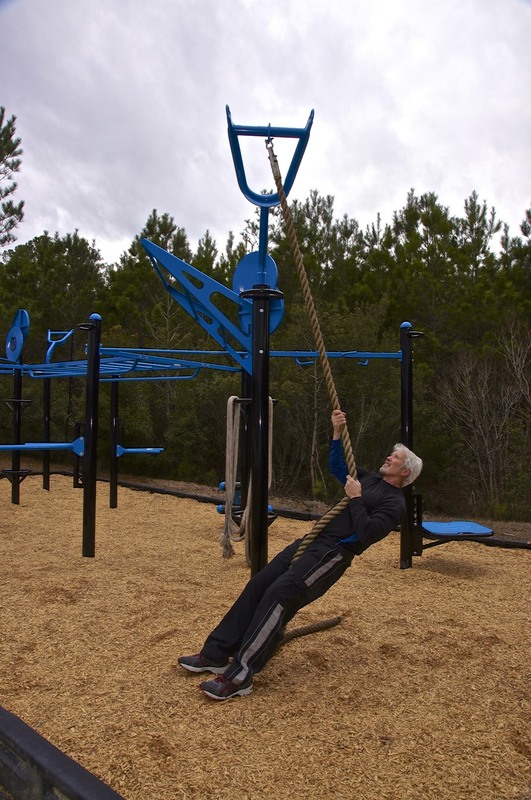 We have a variety of configurations, accessories, and options to target youth to adult training activities. We’ve had many years in perfecting the T-Rex FTS with customers ranging from major Universities, Middle / High Schools, Health Clubs, Parks, Rec Centers, Military, and Home Owners! We know how important it is to keep our the first-responders, military forces, and professional athletes who use our products strong and fit so that they can maximize their performance when needed. 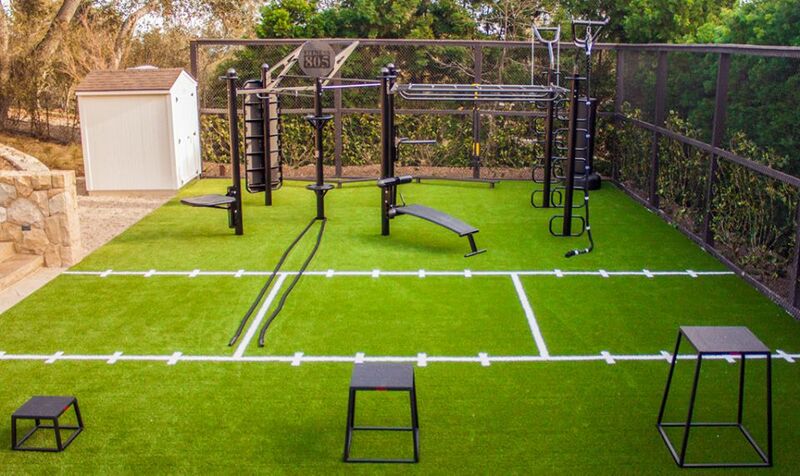 When it comes to building your outdoor training space, use our top quality tried and tested products built here in the U.S.A. 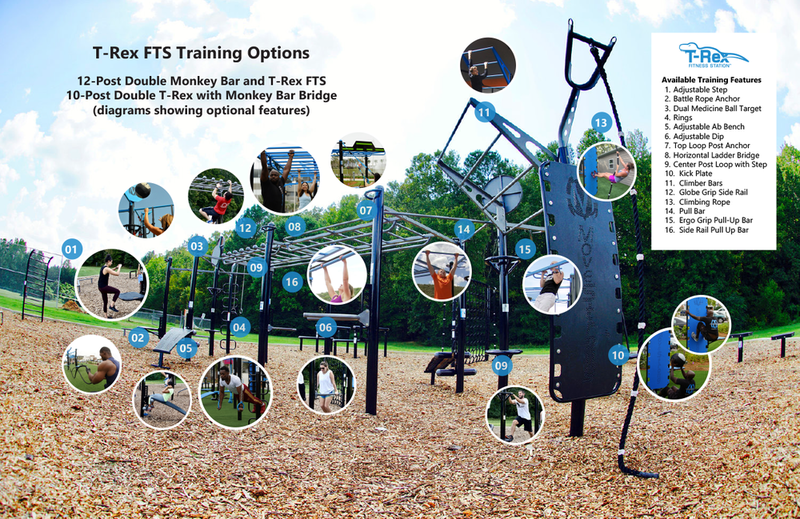 Combine the T-Rex FTS with other MoveStrong FitGround products for a complete outdoor training experience including obstacle course design layout. A new and improved adjustable attachment design for the Dip, Step, and Ab Bench allows for a more efficient adjustment and reduced wearing with the new design perfected after years of outdoor use in various commercial settings. 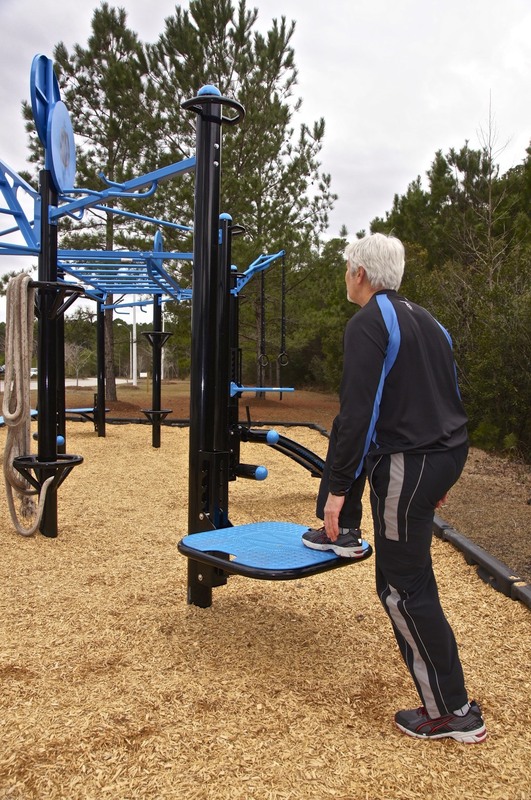 The Patent Pending design of the adjustable training features is ideal for different user heights, ability levels, and scalability while providing durability for a long lasting life of your outdoor functional fitness equipment. While T-Rex training features are adjustable, they are not removable once installed to help prevent loss or theft of the adjustable attachments. 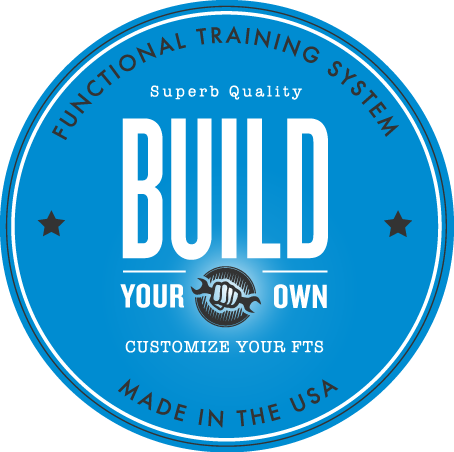 The unique design helps make bodyweight training and calisthenics workouts more accessible to perform scalable exercises and fit user height needs. The adjustable Dip, Step, and Ab Bench also have the option to be bolted directly to the post in a fixed static position. This special design option gives customers the ability to choose between adjustable attachments or a fixed position. The Adjustable Step attachment can be incorporated into your custom design configuration of the MoveStrong T-Rex. A polyurea surface for a durable and long lasting finish to hold up to users feet, rain, dirt, and mud. Solid and sturdy for Step-up exercises, single leg squats, plyo box exercises like plyo jumps and others. Integrated grab handles for assistance in adjusting height. A fixed static height option allows the Step to be bolted in a fix position if desired. 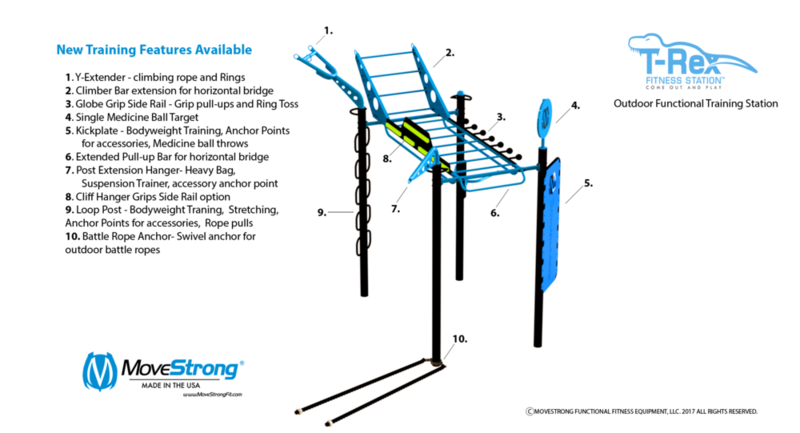 This attachment helps users of varying height easily perform scalable bodyweight exercises by moving the dip bars up and down to fit user needs for exercise to be performed. Great for upper body strength exercises like dips, jumping dip, static press holds, and core exercises like leg raises and knee-ups. The Dip can also be attached in one fixed position if desired or use the Adjustable plates for varying height settings. The bench offers the new adjustment design. 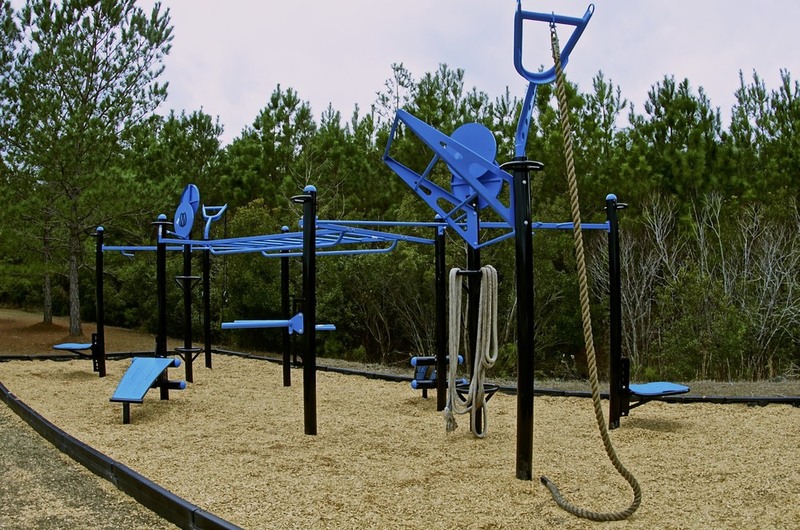 Another optional feature to customize your outdoor Functional Training Station. A contoured arch design allows for lying comfort compared to a flat surface. Foot anchor and a grab bar give options for core exercises like sit-ups, crunches, or lie with head facing post and use grab bar for leg raise, lifts, and curl-up exercise. A polyurea coated surface insulates against heat for lying down on bench and offers a durable coating finish. MoveStrong Outdoor Battle Ropes rated for all-weather conditions and attached to the T-Rex FTS post using our special designed clamp that affixes two Battle Ropes to the post yet allowing freedom of movement needed to perform waves and slam exercises. The MoveStrong outdoor Battle Ropes do not absorb water or fray easily. The Ropes also have a sleeve cover at the post connection point to reduce wear at point of contact with pivoting clamp. Grip knots on ends to assist user with grip strength needs for extended workout sets. A great tool for all ability levels and even wheelchair friendly accessible with the proper surfacing. 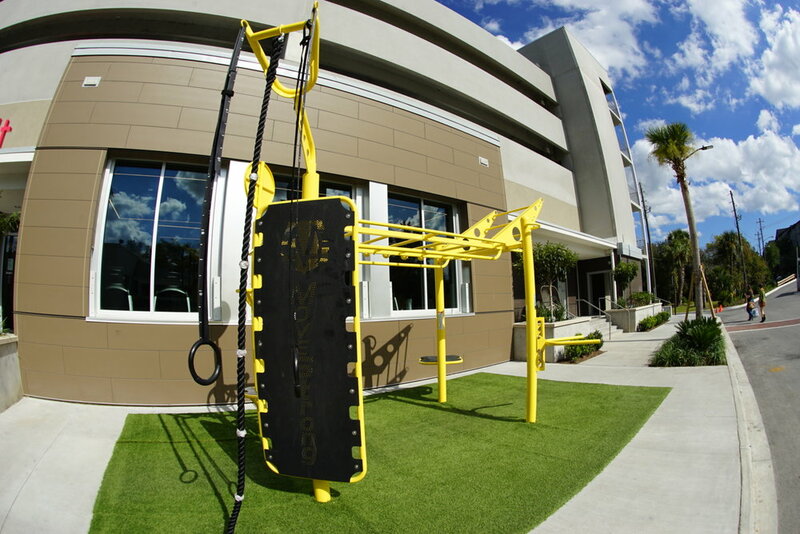 The outdoor Battle Rope station provides an excellent way to warm-up the upper body, work conditioning for fat loss, and part of HIIT and Functional Fitness group workouts and class circuits. This extension is ideal for our new outdoor rated heavy bag. Extended outwards away from post giving clearance need for boxing, kickboxing, and MMA style training. Great for HIIT and conditioning group class workouts. The top post extension can be used to anchor other fitness accessories like suspension Elevate Trainer , bands, ropes, or other tools used to anchor in overhead position. Designed for dual sided use and offers dual height Ergo-grip handle bars for more comfort in varied grip pull-ups and body weight exercises. Wide grip, Mid pronate grip, Close grip, and Under hand grip handle positions and two heights. Comes with a new Polyurea coating for Medicine Ball Throws, Body Weight Exercises, And Climbing Rope Assist and Bounding. A strong and resilient coating finishes to take the abuses from feet and medicine balls. Special design edges of Kickplate also offer grab handles and anchor points for your fitness resistance bands and other accessories. Now offering two styles of Loop Post for Anchoring fitness accessories and for use in Body Weight Training. Ideal as a step-up as well to reach pull-up and monkey bars. Use the Vertical Loops Post with your outdoor Rings for foot placement in performing rows and push ups for more challenging exercises. 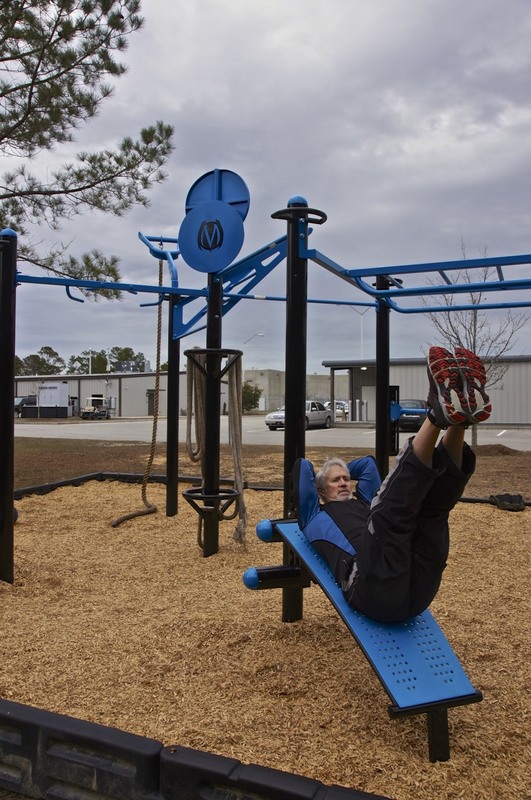 Three Optional Height Pull-up bars and Dual Height Monkey Bar mounting options! This means upon installation customer decides between a 7’, 7.5’, or 8’ pull-up bar! And Monkey Bar heights of 7.5’ or 8’. Giving options for user height planned on both pull-up bars and monkey bar horizontal ladder. 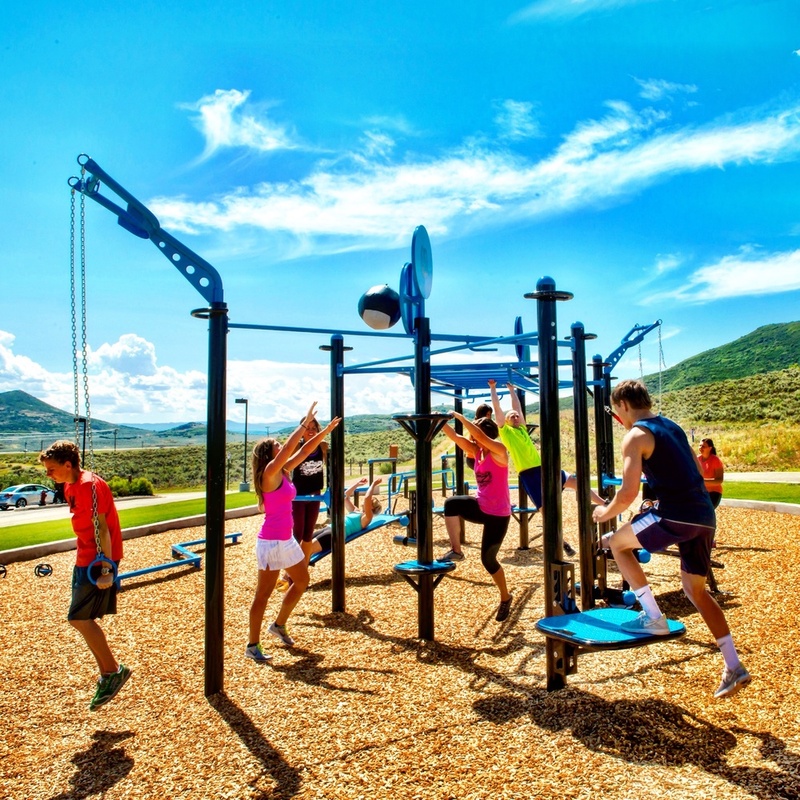 The MoveStrong T-Rex Fitness Station™ is specifically designed to weather tough outdoor conditions and allow for year around functional fitness and bodyweight exercising for adults. Customize with the exercise options desired to create your own station to accommodate different users’ fitness and skill levels. 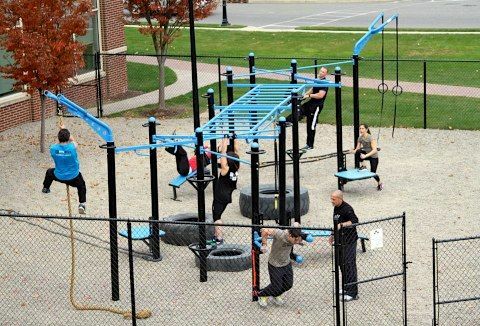 Ideal for fitness bootcamps, group training classes, schools, public parks, military, or a backyard training space! Customize for your size space and training needs. Quality made in the USA! The customizable MoveStrong T-Rex Functional Training Station in action! Some of our new optional training features. Build Your Own today! *T-Rex Post come standard for in-ground anchoring. Concrete surface mounting plates for T-rex post are available and must be ordered. With the rugged outdoor T-Rex, countless configurations are available based on the size and features you need. New options and configuration are constantly being released so please inquire about something specific to fit your needs. The only limitation is the amount of space you have available. Here are just a few samples of T-Rex configurations and unique optional features. In-Line T-Rex 7-Post. Modular in length desired. The T-Rex comes standard prepared for in-ground installation. Can be ordered for surface anchoring on concrete with special posts for this option. 10’10” L x 10’10” W x 8’5” H base standard 5-post model shown without add-on features (Dip, Step, Y-Extender, or Ab Bench). Overall dimensions will vary based on added training features selected. A single monkey bar bridge is 8’ in length. Bridges can be connected together by adding additional post and additional sets of monkey bars. 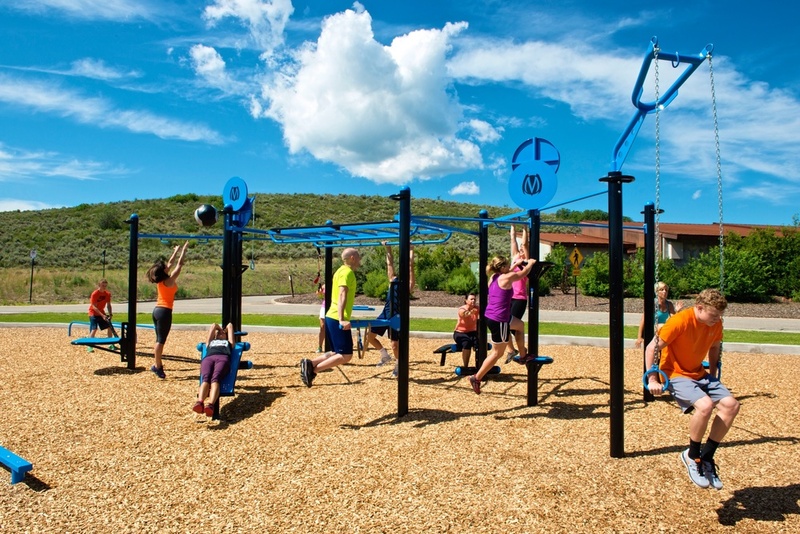 Monkey bar bridges have lower rails standard for added exercise options and anchoring fitness bands and suspension trainers. Side mount bridge features for adding more pull-up bars, globe grip rails, or Cliff Hanger grips. Powder coat finish in gloss black and MoveStrong Blue are standard colors. Multiple custom color options available. Polyurea coating feature for insulating and protection of step, kickplate, and ab board attachment. Inquire about Polyurea for Pull-up and Dips bars also. Standard 5-Post T-Rex FTS shown. Dimensions vary based on the configuration and training options selected in creating a T-Rex FTS that fits needs and space. Use our online 3D animated program to choose the T-Rex FTS model and configure with the options you choose. Build on screen and submit your custom configuration to MoveStrong for a quote. Start now by visiting here. See all the T-Rex Outdoor FTS features in action here! Customize with the features you choose. Center post platform and rings post. Standard 1.25" diameter pull-up bar at two heights of 7.5' and 8'. Y-extender feature for top post mounting that is ideal for gymnastic rings and climbing ropes. Creates an 11' high attachment point. T-Rex FTS group workout. Large groups utilizing bodyweight and the latest in functional fitness. The MoveStrong FitGround outdoor functional fitness area as installed at Berkley Riverfront Park. Group circuit workout with bodyweight and functional fitness exercises with battle ropes, pull-ups, box jumps, recline rows, push-ups, and more! Ergo grip handle pull-up bar. Monkey bar bridge with lower rails and add-on side pull-up bar. More side bridge options too. 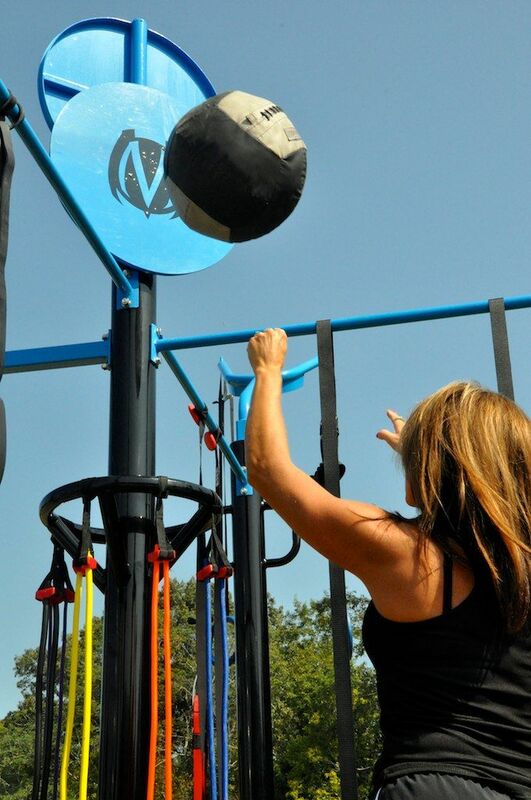 The Kickplate is ideal for functional fitness bodyweight exercises, bounding, handstands, and medicine ball toss. 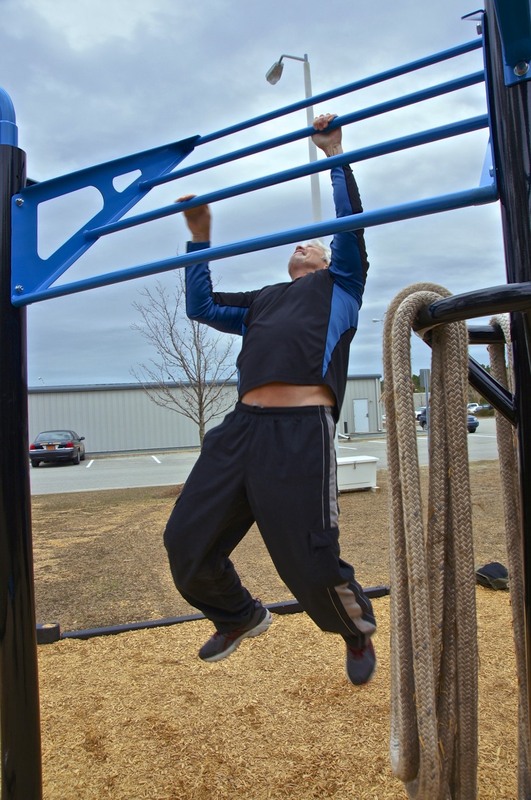 Cliff Hanger grips for the MoveStrong T-Rex Outdoor Functional Training Station. Medicine ball targets at 9' and 10' height. Top post loop anchor for suspension trainers and other fitness accessories are included on post. The Kickplate feature on MoveStrong T-Rex outdoor FTS allows for medicine ball throw and toss exercises to build core strength and power.